A purportedly leaked training document from Verizon reveals America's No. 1 cellular carrier may debut an enhanced subscriber plan dubbed "VZ Edge," which will shorten the period customers have to wait between device upgrades. The document, entitled "VZ Edge Strategy," outlines a no-contract payment plan that breaks up a smartphone's initial cost into monthly installments, but still allows customers to upgrade to a newer model after 50 percent of the device is paid off, reports Droid Life. 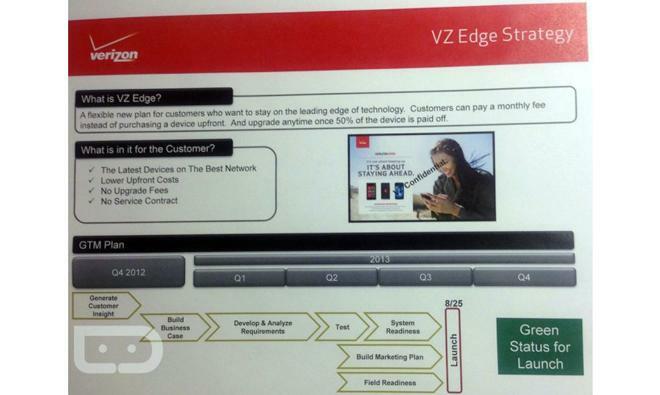 If the training guide is legitimate, Verizon is planning to launch VZ Edge by August 25. As seen above, the plan could lower upfront costs for users wanting the latest technology, which is usually the most expensive, while negating upgrade fees and keeping the agreement pre-paid. VZ Edge looks to be very similar to T-Mobile's recently announced "Jump" program, which affords customers two upgrades each year for $10 per month. Basically, users are able to pay the same subsidized device price as a new customer, but skip the usual upgrade eligibility cycle by paying a monthly fee. Telecoms are looking for new ways to generate churn for costly smartphones and attached data plans, with many moving away from the traditional subscription model. It was T-Mobile that unveiled a no-contract iPhone plan alongside the "Uncarrier" initiative in March. Under that deal, customers pay an upfront fee of $99 for a 16GB iPhone 5, with the remaining cost of the handset spread out over 20 additional monthly payments of $20.